Northern Ontario School of Medicine (NOSM) Elders are Indigenous persons who have certain gifts for working with community members. Each of these gifts, separately or together, is related to maintaining the holistic health of a community, and each of these gifts could be utilized in a ‘healing’ effort by Elders. At the same time, all Elders share qualities or characteristics which are recognized by the community as qualities or characteristics which the community may reference when bestowing Elder status on an individual. In Indigenous culture, Elders are the essential link to the past and to the future. Elders provide continuity and complete the ‘circle of life’ so that individuals, family and extended family and community view themselves, and subsequently behave, as a confident and complete whole. Their knowledgeable, wise, patient, understanding, and accepting approach is an essential part of any healthy group dynamic. Indigenous Elders and others have identified additional reasons for their involvement with NOSM. Elders provide a deep and solid foundation of knowledge and experience on which to ‘grow a family’. Additionally, they provide a clear and easily seen connection through the generations, as they have lived almost a full cycle themselves. For NOSM Indigenous students, the presence and work of Elders can be a key factor which contributes to student success. Elders help students balance the two worlds which they may see themselves living within – that of home and that of the School. Elders may assist Indigenous students in understanding their ancestry and maintaining a positive identity and self-image by gaining greater knowledge and appreciation of their roots. For all students, Elders can provide a safe and willing sounding board, as well as a caring, objective, accepting and non-judgmental confidante during difficult times, whether those difficulties are academic, social or otherwise. Elders provide advice and guidance in such a way that the recipient is sufficiently empowered and confident to make their own conclusions and subsequent decisions about an issue, thereby taking ownership and increasing probability of success. For staff and faculty, Elders provide an open-minded and accepting approach in their observation, reflection and advice. Informal and formal teachings are provided to raise awareness of Indigenous history and worldview and to help both Indigenous and non-Indigenous staff and faculty increase their own cultural competency. Elders are essential consultants around new developments at the School, whether it is a student recruitment effort or a research project to be conducted in an Indigenous community. Involving Elders early on in project conception and design is one of the best ways the School can ensure Indigenous concerns and sensitivities are incorporated in School activities at the outset. Elders do not provide advice and guidance randomly, or without being requested to do so. However, when asked, it is important that their input be well-heard, acknowledged and followed through on in some manner. This is part of the reciprocal nature of an Elder’s work. If they see that their role has helped to achieve positive results, they are inspired to continue in that role and improve their contribution through regular and on-going learning and professional development on their own part. Traditional knowledge, healing medicines, and ceremony. From August 18 – 20, 2015, NOSM’s Indigenous Affairs Unit held a historic Elder’s gathering on the traditional lands of Fort William First Nation. The gathering brought together Indigenous Elders from First Nations and Métis communities across NOSM’s wider campus of Northern Ontario to discuss the future of the School’s Council of Elders. Since 2005, the School had developed relationships with more than 20 Elders who each have special gifts for working with community members. NOSM’s Council of Elders was comprised of these Indigenous peoples who possess gifts and significant knowledge of traditional, cultural, and spiritual customs and practices. Each of these gifts, separately or together, is related to maintaining the holistic health of a community. Their knowledge is gained through a full life of learning, experiences, and teachings received from other Elders and traditional people. NOSM recognized the need to restructure the Council of Elders, reduce the number of Elders formally engaged with the School, and develop a more formal process for determining which Elders would work with NOSM learners, staff, and faculty. Rather than forming a corporate style working group, the School decided it was best to bring the question on how to restructure the Council of Elders to the Elders themselves and chose the traditional way of bringing how to change the Council of Elders to the spirits for guidance through ceremony. Since the gathering in 2015, the Council of Elders has been be comprised of eight Elders, with four female and four male representatives. Each Elder represents one of the cardinal directions of the medicine wheel to ensure the spiritual, cultural, political, and territory of each region is represented. NOSM Elders provide support to NOSM’s Indigenous learners; provide cultural teachings to students, staff, and faculty; offer traditional ceremonies and blessings; ensure Indigenous medical students are recruited to the School; review applications for Indigenous applicants to the School; participate in quarterly meetings of the School’s Indigenous Reference Group meetings; assist with developing and approve Indigenous content in NOSM’s curriculum; and, work with the School to ensure connections are maintained with First Nations and Métis communities across the North. 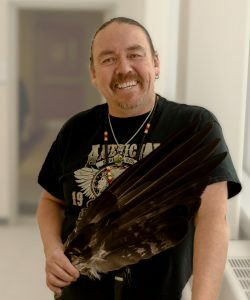 Perry McLeod-Shabogesic, from Nipissing First Nation, is an Indigenous Knowledge Keeper who has been working with the Northern Ontario School of Medicine community for 10 years. McLeod-Shabogesic, Director of Traditional Programming at Shkagamik-Kwe Health Centre, has been involved in a wide range of activities with the School, including orientation week for new medical students and the annual CampMed for high school students interested in a career in health care. He also shares stories with NOSM medical students, faculty, and staff at Elder-on-Campus sessions.